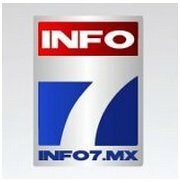 News TV Channel / XHFN-TDT is a television station in Monterrey, Nuevo Leon, Mexico. The station carries the Azteca 7 network and also serves as the key station of the Azteca Noreste regional network, serving the northeastern states of Mexico with regional news and programming. XHFN signed on in February 1974 on channel 8, under the auspices of CEMPAE (Centro para el Estudio de Medios y Procedimientos Avanzados de la Educación, or "Center for the Study of Advanced Media and Education Processes"). It primarily broadcast educational programs and telecourses. In 1983, XHFN became one of several local stations under the auspices of Imevisión, broadcasting programs from its two networks as well as local Monterrey productions, including local news. In 1993, XHFN was part of the media package that became Televisión Azteca. Also in the 1990s, it moved from channel 8 to channel 7.
a+ (A Más) is a regionalized television service in Mexico operated by TV Azteca. It launched in five cities on March 20, 2017, and it expanded to 34 additional cities on April 7, 2017. a+ is broadcast as the second digital subchannel (usually 7.2) of the Azteca 7 transmitters in each area.